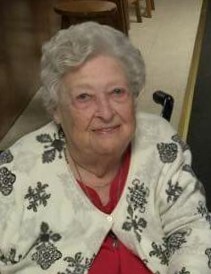 Winnie Brooks Foxworth McCarthy, 95, of Warner Robins, GA and formally of Phenix City, AL passed away early Friday morning, April 13, 2018 at her daughter’s home in Warner Robins. Graveside services will be held 3:00 pm EDT Tuesday, April 17, 2018 at Lakeview Memory Gardens with Rev. Roosevelt Oakes officiating. The family will receive friends on Tuesday one hour prior to the graveside service at Vance Memorial Chapel in Phenix City. Mrs. McCarthy was born February 18, 1923 in Coffee County, AL to the late Aaron Brooks and Mandy Richards Brooks. She was employed with the Eagle and Phenix Mill. She also served as church secretary and was retired with 25 years of faithful service with Wakulla Springs Baptist Church in Tallassee, FL, and was a member of The Rain Church in Warner Robins, GA. She enjoyed quilting, crocheting, working puzzles, and spending quality time with family and all her grandchildren. Other than her parents, she was preceded in death by her husbands, Grayer C. Foxworth, and Henry C. McCarthy, one son, Howard Foxworth, three sisters, four brothers, two grandchildren, and three great grandchildren. She is survived by one daughter, Bettie Clayton of Warner Robins, GA, son LaRay Foxworth and wife Sherry of Phenix City, AL, daurhter-in-law, Helen Foxworth, sister, Louise Jernigan, (7) grandchildren, (19) great grandchildren, (12) great great grandchildren, a host of extended family, and many caring friends. In lieu of flowers, the family request donations to the American Cancer Society.